Carl Howse has been performing magic at weddings in Aberdeen and Scotland for more than 15 years and is the perfect choice to enhance your special day. Suitable for all ages form Grannies to young toddlers. 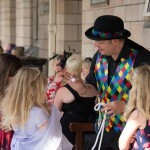 Carl’s amazing interactive magic is a blend of skill and humour and is guaranteed to entertain your guests and keep them talking about how much fun they had for a long time after. 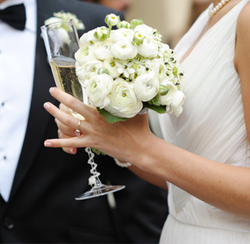 Your wedding will probably be the biggest party you will ever throw and your guests are there to enjoy it with you and take away some special memories. 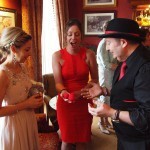 Hiring Carl as your wedding magician will help ensure this happens and is fantastic value for money. In-between courses during the meal, Carl can move between tables performing a short show for your guests, providing a talking point that always gets them chatting, “How does he do that”. This is great ice breaker for tables where people have just met each other and can provide some great photo opportunities for your photographer to capture their reactions. At the start of the evening’s entertainment and before the music is in full swing, there can be a bit of a gap as new guests arrive and people are standing at the bar. During this period Carl can mix and mingle with people and will soon have them chatting and laughing while he amuses and amazes them with his easy going personality and mind blowing close-up magic. Newlyweds to be, book Carl months and even years in advance for their special day, so please enquire early to avoid disappointment.
} Dear Carl, on behalf of myself, Andy and all our guests we would to say thank you very much for keeping everyone thoroughly entertained at our wedding at Drumtochty Castle last month. People are still talking about the amazing tricks you performed and the way you mesmerized the children with your magic and super balloon models, keeping them smiling and laughing. You did a fantastic job.
} We booked Carl for our wedding after he was recommended by a friend and he certainly added something special to the day. Not only was he very professional to deal with but he is a really nice guy and this comes over in his work. We didn’t get to see all of his performance but he did do a special wedding trick for us. All the parents said he was great with the kids and kept them well entertained with his magic and balloon models, even some of the adults went home with aliens and various animals. I wouldn’t hesitate in recommending Carl to anyone.